Ms. Pelosi countered with a move of her own on Thursday, naming the Democrats who will lead a new special select committee on climate change — and leaving off the chief architect of the Green New Deal, Representative Alexandria Ocasio-Cortez of New York. 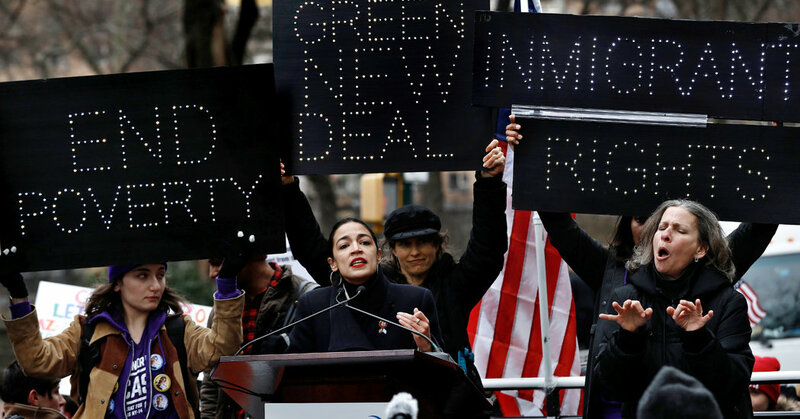 Still, the measure, drafted by Ms. Ocasio-Cortez and Senator Edward J. Markey of Massachusetts, gives shape and substance to an idea that, until now, had been a vague rallying cry for a grand stimulus package around climate change. The proposal does not set a date for eliminating fossil fuels. It does call for generating 100 percent of electricity through renewable sources like wind and solar in the next 10 years, eliminating greenhouse emissions in manufacturing and forestry “as much as is technologically feasible,” and re-engineering cars and trucks to end climate pollution. Sixty members of the House and nine senators are co-sponsoring the resolution, including several presidential candidates, according to a fact sheet provided by Ms. Ocasio-Cortez’s office. There is no mention of costs or how to pay for the proposed changes. Ms. Pelosi has been decidedly cool to the proposal, but not the movement behind it. People close to Ms. Pelosi said she is wary of moving too quickly, mindful of her own past mistakes. A decade ago she pushed the last major climate change measure hard, an ambitious bill to cap emissions of climate-warming pollution, then allow industries to trade emissions credits on a pollution credit market. Through force of will, she got the cap-and-trade measure through the House, only to see it die in the Senate without a vote. The next year, Democrats were swept from power. In that Congress, she had a Democratic Senate and a Democratic president, Barack Obama. This time, she has a president who calls climate change a hoax and a Senate in the control of Mitch McConnell, a Republican from the coal state of Kentucky. On Friday, Ms. Pelosi was intent on letting her critics on the left know about her own efforts under Presidents Bush and Obama, adding that she had made climate change “her flagship issue” of her first speakership, and boasting that her legislation was “one of the biggest energy bills” in history.